Guided Cape Town Tours throughout the City, Cape Peninsula, Winelands and Southern Cape. We are proud to offer you a wide selection of trips. - Click here - to select a Cape Town Tour. We've been touring people in & around Cape Town for over 12 years.... and it's safe to say we know our Cape Town Tours. Join us and discover why Cape Town is truly one of the most beautiful cities in the world. 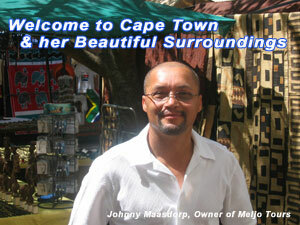 All your Cape Town Tours are done by certified South African tour guides. And all vehicles are professionally maintained and equipped for enjoying your holiday trip in comfort and style. Every Cape Town Tour has a great number of highlights, a friendly guide and a personal touch. Each tour can be tailored to your needs... any pick-up (and drop off) point can be arranged in and around Cape Town.